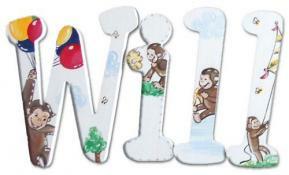 Handpainted Curious George Wall Letters - Personalize a kid's room with our Curious George handpainted wall letters. We can modify this design to include your room colors and your favorite Curious George story. Tell us your inspiration, and our amazing artists will hand paint it on your wood wall letters. It's such a fun and attractive way to personalize a kid's bedroom. Each Curious George wall letter is handpainted with top quality paints and sealed with a non-toxic, non-yellowing varnish to ensure that the wood wall letters will last for years to come. Full Description Handpainted Curious George Wall Letters - Personalize a kid's room with our Curious George handpainted wall letters. We can modify this design to include your room colors and your favorite Curious George story. Tell us your inspiration, and our amazing artists will hand paint it on your wood wall letters. It's such a fun and attractive way to personalize a kid's bedroom. Each Curious George wall letter is handpainted with top quality paints and sealed with a non-toxic, non-yellowing varnish to ensure that the wood wall letters will last for years to come.